Dr. Colbert sat down with this tasty lunch of veggies, cabbage and lettuce today. 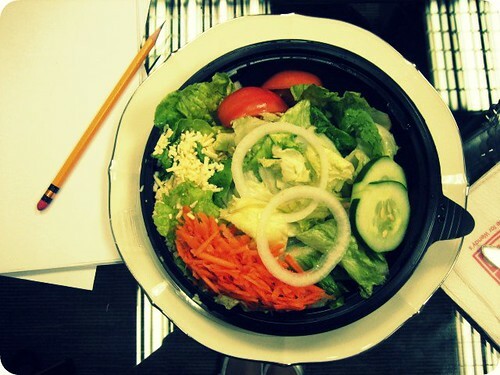 He sent this tip along with the meal – “Stoke your metabolism during lunch”. That’s right, don’t skip this super important meal! There is always time to keep your body in tip top shape. Take notes on this one! Doctor Colbert always gets a ton of veggies in his meals. As a general rule of thumb the richer the colors, the better foods are (if those colors are naturally made, of course!). Which is exactly why Dr. Colbert always has such vibrant meals on his plate. Doctor’s Lunch : Anti-oxidant rich! Lunching on anti-oxidants and vitamins! Broccoli, Zucchini and Mushrooms : delicious. Brilliant colors are the key to energy. Check out Doctor Colbert’s lunch – a dish of squash, spinach, arugala, yams and jerk chicken! Almost every vitamin imaginable is here. Delicious Asian salad with a load of green veggies! Dr. Colbert’s protein packed breakfast. Plus, his trusty companion, The HSR Diet. Dr. Colbert creates another City Bakery salad masterpiece of brillant colors and nature’s best farmer’s market foods from union square! Who says New Yorkers don’t eat farm fresh?! Here’s an after New Years Eve Doctor’s Dish. Top it off with the New York Times, and you have yourself a top notch meal.